New In 2019 - Updated 5 Night Packages. ​Limited Spots. Read On For More Info. ​Heliskiing with us is all about total flexibility. We recognise that New Zealand snow and weather conditions can be changeable and it isn't always possible to predict exactly how many days you'll be able to fly. You can either book a package, or simply book your transfers, lodging and non-heli ski days up front, while keep the heliskiing part fully flexible. If you choose the flexible option, your actual flying days will be included in the final bill. That way, you'll only ever pay for what you actually end up doing. The signature High Peak trip is a five-night stay, including three heliski days and two non-heliski days. This allows you to sample the best heliskiing in New Zealand combined with the best lift-accessed off-piste skiing in New Zealand via our Club Fields. Five-Night Packages include three five-run heliski days, two guided club field or resort ski days, airport transfers, all transport, five nights' all-inclusive lodging, gourmet meals and an open bar. Club field ski days can be upgraded to a heliski day for $795 extra per person. It may be possible to add an extra ski day or two to the trip depending on your arrival and departure times. ​For the ultimate in convenience, heli transfers from the lodge to the heliski base start at $300 per person one way based on 5 passengers. *Peak season runs from 15 July - 15 September. All rates are in NZD and include 15% GST. Skiing with us works best when a group books out the whole chalet on an exclusive basis. We offer three options here: Four skiers with their own rooms, eight skiers on a twin share basis, or any combination of the above. Here are our basic per person prices (all prices in $NZD). And our group services (all prices in $NZD). *For four people, plus the cost of activities, if any. 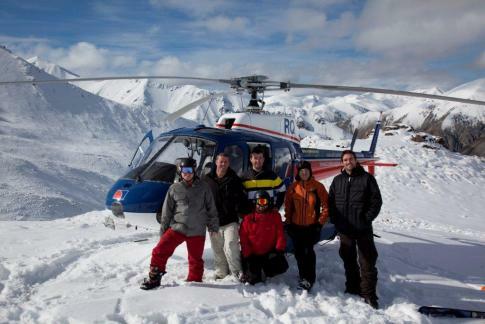 Private Charter Heliskiing is our premier experience, which is why we put it at the top of the list. Think exclusive lodging and a helicopter for the private use of your group alone. We base the helicopter at the lodge for the ultimate in ease and flexibility, allowing us to make use of every opportunity to ski. With Private Charter, you pay by the flight hour as opposed to a fixed rate, and it isn't as expensive as you might think. If there are between 1 and 8 of you and you want the ultimate in New Zealand skiing, you should consider this option. Every package is customised and rates are on application. ​We take pride in offering our guests the ideal ski trip for their aspirations and budget. Our Special Packages represent the ultimate in flexibility and customisation. Custom Trips We can design a custom trip for your group with any combination of heliski, club field and non-skiing days ​that you require. Private Charter We specialise in Private Charter Heliskiing. This means you can have exclusive use of an aircraft, pilot and guides for your group alone. Heli Transfers For the ultimate in ease and luxury, we can pick you up from the airport and base the helicopter from the lodge, flying from the front door direct to the snow each day. Rates start from $300pp one way. Group Rates For the best experience possible we encourage you to gather a group of four or more and book out the lodge privately. Please ask about our special group booking rates. When do you operate heliski trips during the season? We operate every fine day between 1 July and 30 September, other times by arrangement. What do I need to organise for the trip? Your flights or alternative transport to Christchurch and travel insurance to cover heliskiing. We will take care of the rest. We ask for a 50% deposit of the package price to secure a booking, with the balance plus any extras payable upon departure. We offer a full refund of your deposit up to 31 days before your arrival date. Inside 31 days before the arrival date we cannot offer a refund but can transfer you to another date free of charge. Minimal, if any. The only cost you may need to account for is ski hire ($45 / day for demo quality gear). What is the story with Christchurch Airport Transfers? Packages include airport transfers. Additional transfers are NZ$200 one way. We encourage guests to coordinate flight times if coming from different places. What times can we expect to be picked up or dropped off? We can meet any arrival or check-in before 10pm and after 7am; outside these times we suggest an airport hotel. Why wouldn't I just book directly with Methven Heliski? We encourage those on a budget to take this option. You'll have to arrange your own rental car or alternative transport, ski gear, accommodation, food and drinks and fend for yourself on no-fly days. What if the weather is bad and the helicopter can't fly? We have the option of taking you to one of our local club fields - a truly unique experience - or a commercial resort like Mt Hutt. What if the ski fields are closed? Don't worry - we have a few other tricks up our sleeves that we're pretty sure you'll love. Our job is to maximise your time off, whatever Mother Nature throws at us. What if I book a package and we can't fly all three days? If the weather precludes us from flying all three days you will not be charged for any unused heliski days. This will be reflected in the final bill. What level skier or boarder do I need to be to heliski? Any reasonably fit and confident skier or snowboarder can experience the thrill of skiing and riding in the big mountains. We will help you assess your ability properly. How long are the heliski days? You can expect to be out in the mountains for approximately 5-6 hours each day, more if you're feeling fit and opt for our extra runs. Good quality ski wear and your own skis or board. If you don't have these, let us know and we will arrange some top quality rental equipment for you. We are limited to four skiers per guide. Skiers will be grouped according to ability and terrain selected accordingly. Can you arrange private charters? Yes. We specialise in private group charters. This is where you have your own dedicated helicopter, guides and terrain. Please enquire if you're interested. Can we fly directly from the lodge? Yes. We can base the helicopter from the lodge and fly you directly into the mountains each day. Prices start at $300pp one way. Please enquire if you're interested. We encourage our guests to take out comprehensive travel insurance that covers heliskiing. Remember, New Zealand's ACC system covers all injury related-costs while in-country, but not loss of deposits, equipment, missed days or flights.